This week was a busy one at our library! We celebrated National Take Your Child to the Library day on February 1st with a LEGOs at the Library program, hosted a tech lab for 8-12 year olds on Digital Learning Day, added an additional preschool storytime at the library (bringing the in-house count to three) and offered a family storytime at a community fire hall as part of our two month Storytime on the Go outreach program. I got the chance to interact with a lot of community members and share library resources with lots of kids and their families! This week’s storytimes were all about My Body. I began the preschool and outreach programs with a book instead of a song because this book is so engaging and fun to look at. 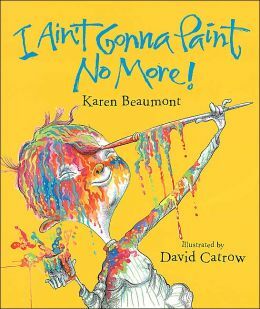 Ain’t Gonna Paint no More is about a boy who loves to paint anything, much to his mother’s dismay, and gets messy while doing it. The words could be sung, but the images are to be savored so reading the text is my preferred mode. I love that kids can anticipate the next body part to be painted by the rhyme that comes before it. Catrow’s illustrations are colorful and exciting, providing for lots of conversation. My favorite page features a painted arm with small black ants all in a row. We find out that the source of those ants is a mouth painted on the boy’s hand featured on the next page. After talking about our basic body parts it was time to talk about what’s under our skin. I brought out the book, My Body (DK Children, 1991), part of the What’s Inside? series. The first chapter includes one picture of a fully clothed boy on one side and then a picture on the right of the boy’s photo peeled up revealing a skeleton underneath. It’s an easy way for kids to appreciate the connection between their bodies and bones and begin a discussion about bones. 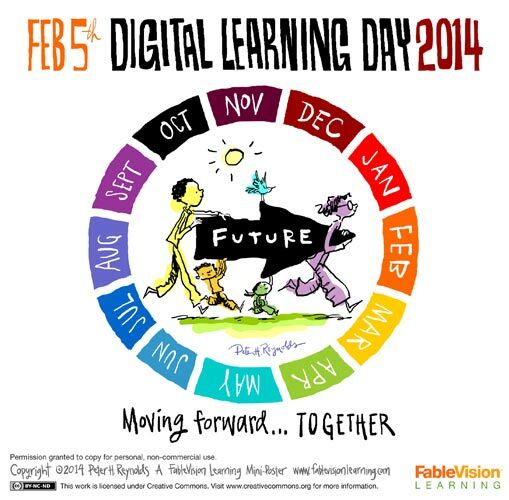 In honor of Digital Learning Day, I brought my iPad to storytime again! Digital media, like apps, give me and the caregivers in attendance more teaching tools and different ways to engage kids. Using an app like this one in storytime, lets parents learn about new high quality apps they could try at home and let’s me model how to use apps with kids. I strongly support joint media engagement and encourage families to use apps together. When I include digital media in storytime, I use it along with many other familiar tools so kids see there is a time for digital media and a time for books, toys, songs, and the like. App: This is My Body (urbn;pockets, 2014) This is my Body is one of two iPad apps I looked at for use during this storytime. The other app called The Human Body (Tinybop, 2013) is a more complex app with high quality images, incredible detail, and an interesting Q&A feature, but I felt that This is my Body offered the basic features I needed for a quick activity in a preschool-friendly package. I chose to focus on the skeleton with this app and introduce it by talking about the skeleton as a puzzle. I started by showing families the starting page and what is included in the app. Then I tapped on the skeleton section, revealing a completed skeleton with a place to tap for the activity page. Select bones are skittered around the outline of a body and with a tap and a drag a bone can be slid to the right location. If the bone is slid to the right spot, it will stick. If not, it will slide back to the area outside of the body. Kids took turns tapping and dragging different bones to the proper location in the body outline. Using the app in the storytime setting didn’t work quite how I expected, but I would try it again. Here’s what we struggled with: Even with its smaller number of bones, the page still had some bones that kids, particularly the younger ones, weren’t sure where to place. After the larger, more recognizable bones were dropped into the right spot, kids weren’t quite sure what to do. This put kids, especially the younger ones, on the spot as we huddled around the iPad. This may work better mirrored on a big screen so kids don’t feel the need to crowd the iPad making each other feel rushed to figure out the right location for the bone. If I used the app again, I would drag and drop more of the harder to recognize bones (not just one) as I demonstrate how to play the bone game. I provided an information sheet on a healthy media diet and how to find quality digital media for kids so parents had information to take home. If you’re ready for a story, shake and wiggle! Molly Lou’s body is unique, like everyone’s. Catrow’s illustrations celebrate Molly Lou’s beauty and strengthen the book’s message. This is a colorful, fun to read story celebrating our individuality, the love of family, and friendship. A nice read aloud for toddlers, preschoolers, and early elementary. 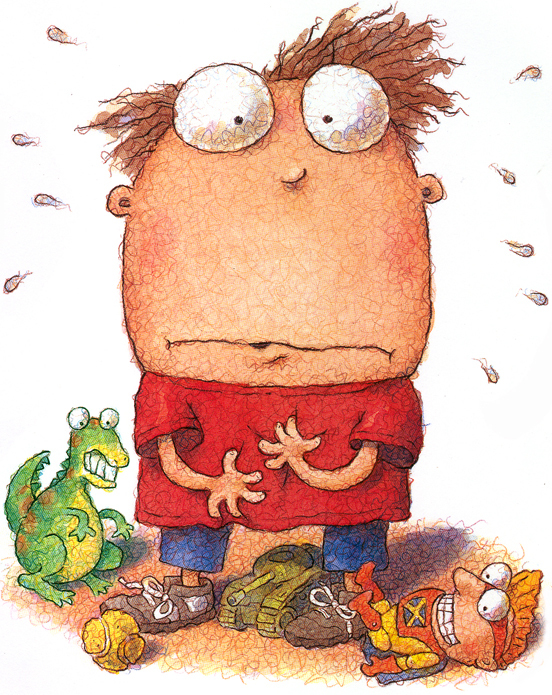 Unlike the other books we read, Parts features a boy who is scared of his own body! He worries about bellybutton fuzz, hairs in his comb, loose teeth and ear wax. Thankfully his parents finally get him sorted out. At one storytime, the kids and I decided this boy, who we named George, should come to storytime to learn a few things about his body! We ended with this fun action song. We started slowly and then repeated the song multiple times, going faster and faster. Head, shoulders, knees & toes, knees & toes. Potatoheads are a fun, hands-on way for kids to learn the basics about body parts. I borrowed this set of potatoheads from a local teacher who is a close friend. Before storytime I made sure all of the potatoheads were blank so kids could build the characters however they wanted to. This also gave caregivers a chance to talk about the body parts as kids added them and what goes where. Some kids added parts in imaginative ways and others placed each part with anatomical accuracy. 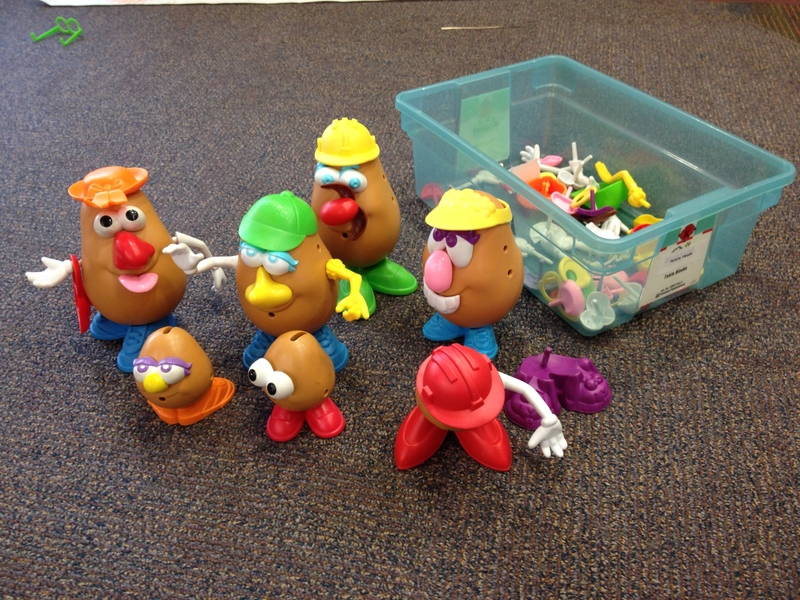 This set of 7 large and small potatoheads worked for well as a station for storytime groups of 7-40 in combination with the second station. I brought a roll of butcher paper from home for this activity. Along with our boxes of markers and crayons that regularly sit at each table during storytime, the paper was the only material needed. The butcher paper was just wide enough for preschool size kids. Caregivers had their child lay on top of the precut sheet of paper while they traced the outline of the child’s body. This often resulted in giggling because outlining a preschooler or toddler’s body often leads to unintended tickling! Once the outline was complete, kids and caregivers went about coloring in body parts and clothes making each one unique.